What's made of real wood, costs $250.00, and plays music whether it's plugged in or not? Power Gig's guitar controller of course. The newest rhythm game on the block boasts something never before seen in the genre- a real guitar packed right in the box. The new axe (now sold separately as well) allows you to actually play while you're playing and maybe really learn a thing or two. The controller also can be used outside of the game, played as a fully functional electric guitar. I'm personally really excited about this game, the 'real guitar' is super unique and has somehow been overlooked by the two big boys of the genre- Rock Band and Guitar hero. In all fairness, RB did introduce the Keyboard this year as well as the more realistic 'pro mode'- but Power Gig is really doing something different here. I hope the game is as well made as the controller and that it does well at retail- it's a great idea that can hopefully evolve a really stagnant genre. Seven45 Studios, the new video game publisher, developer and hardware manufacturer that is a sister company to musical instrument manufacturing giant First Act, has made a limited edition full-size guitar controller for Power Gig: Rise of the SixString available for purchase at PowerGig.com. Power Gig: Rise of the SixString is the first band videogame for which the guitar controller is a fully functioning six-string electric guitar. The game is now available at retail bundled with a real electric guitar, and gamers can now purchase additional full-size guitars for the game on PowerGig.com. The limited edition guitars available on the site are handmade at First Act’s custom shop, and feature a single cutaway basswood body, humbucking pickup, and a maple neck with a rosewood fretboard, all for only $249.99. Power Gig: Rise of the SixString is now available for the PlayStation®3 computer entertainment system and Xbox 360® videogame and entertainment system. Power Gig: Rise of the SixString is the true evolution of the band videogame experience. Its genuine six string guitar functions as a wireless game controller, and features Seven45’s proprietary technology that can distinguish and recognize gamers’ input all along the guitar, making the guitars as easy to pick up and play as any other band game button controllers. 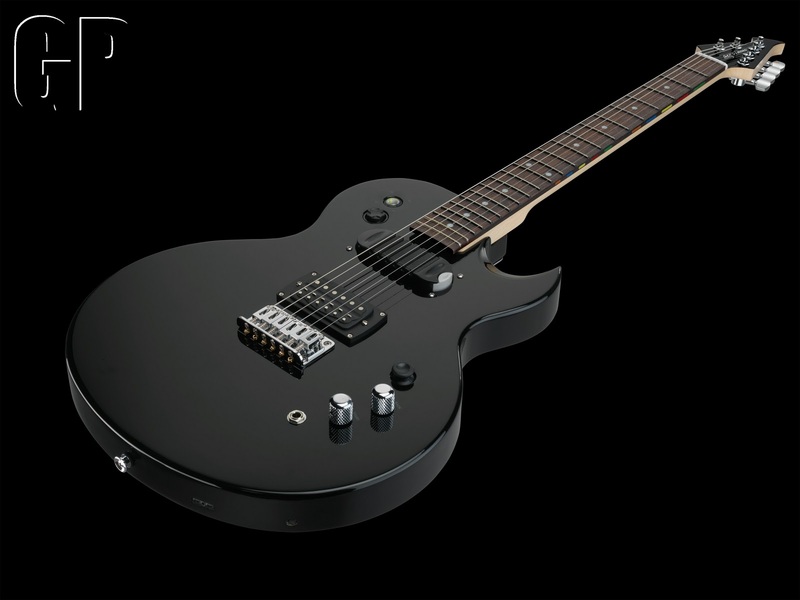 The unique dual-functionality of the SixString allows for use in-game as well as with any standard guitar amplifier. In addition to traditional beat-matching that will be familiar to fans of the band game genre, Power Gig also introduces the option to switch on chording, which presents the added challenge of playing the game using chords that require specific finger placement on the neck. As players progress through the game, becoming more comfortable with a genuine guitar and challenging themselves to play real power chords, they will find the byproduct of playing the game is coming away from it with real-life guitar skills. Eric Clapton, Dave Matthews Band and Kid Rock have each entered into exclusive agreements with Seven45 Studios to provide songs for Power Gig: Rise of the SixString. These deals mark the first time ever that songs from each of the three artists will appear as part of a music videogame. Additional songs were secured by multi-platinum artists John Mayer, No Doubt, Smashing Pumpkins, Jane’s Addiction, Stone Temple Pilots, Rage Against the Machine, and many others. Seven45 Studios also plans to continue building Power Gig’s track list with continued downloadable content (DLC) after the game’s release.